Last week, a tree that John and I have passed many time on the Third Beach Trail was toppled by Mother Nature. 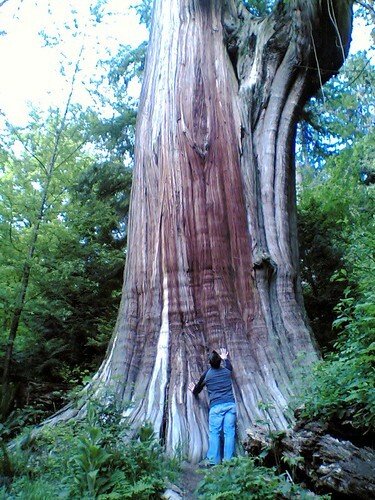 …Staff report that likely the heavy rains on Sunday morning weakened the root mass, and the severe easterly winds that followed later in the day were the cause of the demise of the ancient Western Red Cedar. When the tree fell on Sunday, it split in half, falling across Third Beach Trail. The tree will be left where it fell and the trail around it adjusted to allow safe public access. The last time I walked by that tree it was during one of our early morning walks. I was huffing and puffing up a hill with John leaning back, “almost to the top!” when suddenly we heard the faint sound of music coming from the bushes below. It grew louder and more audible and I soon made out the lyrics, “And thank you very much, Mr. Roboto – For helping me escape just when I needed to…”. That park is always full of surprises. This morning’s update is that the Sea Wall is expected to re-open next week. The article ends by saying more closures will come in the spring, but as for opening next week? I’ll believe it when I see it. I think we should organize a sea wall walk next week and find out! I hope they leave the cedar there so it can be a nurse log.